Dr. Evans proudly announces the birth of THEVite: a multivitamin formulated by Joel M. Evans, M.D. and Steven Fisher, M.D. based on the latest scientific research. Dr. Evans, a physician leader and expert educator in Holistic and Functional Medicine, is intimately familiar with the controversies surrounding vitamin supplementation. It has always been his belief that appropriate vitamin supplementation with quality, pharmaceutical grade products is not only appropriate and safe but a foundation for the correction of the often subtle nutritional deficiencies that are associated with many of today’s illnesses. However, finding a multivitamin with the proper high quality, toxin free ingredients, pharmaceutical industry quality control and manufacturing standards at an affordable price was always a challenge. This task ultimately proved to be impossible, leaving Dr. Evans no alternative but to create and formulate his own multivitamin that would meet his exacting demands by including the safest and most effective nutrients and having them manufactured using the highest quality standards in the industry. After consulting with his internal medicine colleague Steven Fisher, M.D. about the latest nutritional needs for men, they worked together to produce THEVite, the ideal multivitamin for men and women. 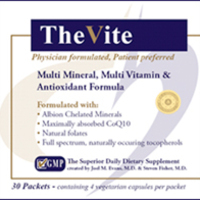 Dr. Evans and Dr. Fisher designed THEVite to serve as the foundation for optimal nutrition, providing the necessary nutrients for the average person eating the average (not getting 10 servings of fruits and vegetables) diet and under an average amount of stress (stress depletes many vitamins from the body). These are provided in forms and quantities that are safe and closest to nature. Our patients are then given additional nutrient recommendations based on their unique medical and genetic needs. Albion Chelated Minerals: In their natural form, minerals are unusable by our bodies, they must first be converted into a biological compound, a process known as chelation. But this natural chelation process is disturbed in many people, meaning the minerals found in most multivitamins could be exiting the body without ever being absorbed and put to use. Using minerals that are already chelated guarantees that the minerals in THEVite will be absorbed and put to good use by the body. High gamma tocopherol and mixed tocopherol Vitamin E: The forms of vitamin E that are safe and the most effective because they are in their natural form. Natural mixed carotenoids from the palm tree fruit—the best and safest source of preformed Vitamin A. Natural Folate supplementation instead of synthetic folic acid eliminates the concern that is beginning to appear in the scientific literature associating synthetic folic acid with cancer. Additional supportive nutrients not typically found in multivitamins, such as alpha lipoic acid, TMG, fruit bioflavonoids, choline and inositol. These nutrients were included because they are so important for disease prevention, energy and mental clarity. All the B vitamins in a generous dose because they are so easily depleted by stress. Also, Vitamin B12 is in the ideal methylcobalamin form. Selenium and iodine are found together in balance here since it is crucial that the body has both for healthy thyroid function as well as breast health and cancer prevention. CoEnzyme Q10 is beneficial in many ways, primarily to support energy metabolism and combat fatigue. Because the heart has very high energy demands and concentrations of CoQ10, THEVite is designed to combat the increasing prevalence of heart disease, the number one cause of death in our country. On a side note, anyone taking statin medication needs the supplemental CoQ10 THEVite provides, as statins deplete the body’s stores of CoQ10. GMP certified production: Because the vitamin industry lacks national regulation and oversight, quality manufacturing standards are often utilized at the discretion of the manufacturer. THEVite is manufactured in a GMP certified facility, guaranteeing that pharmaceutical grade standards are used throughout the production process. THEVite is beneficial for everyone and is sold at a cost ($30 per month) that is substantially less than other quality multivitamins. Dr Evans is proud to have been able to work with Dr. Fisher to create THEVite, a multivitamin that is unequalled in formulation, quality and price. To order THEVite, please call the office (203.321.0200) or send an email to mk@thecwh.com.